Yeah, so… scarring your perfectly-good cleavage with permanent ink? Via OniPepper, who doesn’t mind the results of your poor judgment as long as you post pictures of them on the internets. Do you think she gets more of the EXP bar filled in with each birthday? Tattoo pics always look so bad right when the person first gets one. 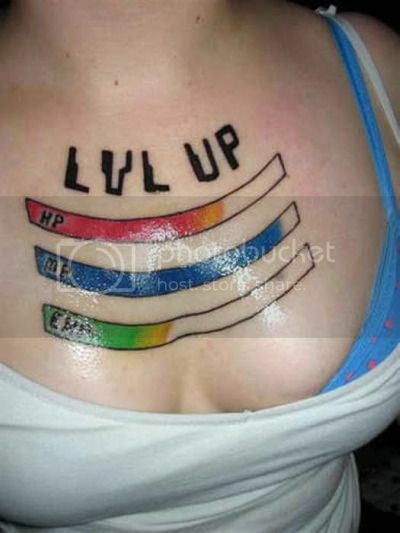 Why not wait until the tat fully sets in and you don’t look like an oily mess? I just wanna know what kind of loot she drops.